Queensland Commodity Services Why should I consider forward pricing? 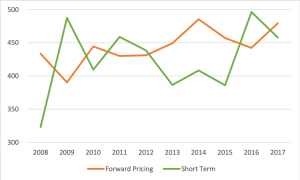 A grower who forward priced over the last 10 years is, on average, $19.06 per IPS tonne of sugar better off than a grower who only priced in-season through the Short Term Pool. Mackay growers were the first in Australia to be able to individually forward price, and have had access to innovative and flexible forward pricing arrangements for more than 15 years. Price up to three seasons ahead of the current season, within limits of 60% of 2020, 50% of 2021 & 40% of 2022 Season GEI Sugar. Sugar is committed for the relevant season once it is priced. Until then, you can add or remove tonnage. Let QCS manage the pricing & marketing decisions for you or control your own pricing outcomes. Call us for a chat, or read more about the QCS pooling and pricing options in our 2019 Season Marketing Guide. Once GEI marketing nominations close on 5 March 2019, you will be able to choose pooling and pricing options for the sugar you have nominated to QCS as a GEI marketer. Click here to download a copy of this fact sheet.